Divided Back Vintage Postcard in Good, Unused Condition. This post card was published by W.G. MacFarlane and part of the Troilene Animal Series. 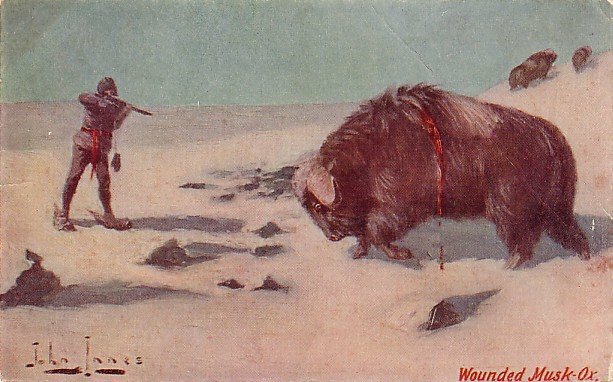 Wounded Musk Ox. Far, far to the North, where the winter works its will upon the desolate reaches of rocks, and ice, and mosses, and scrub, the musk oxen make their home. They are not numerous as the buffalo were, and the number now supposed to inhabit this continent has been estimated at about nine thousand. However, explorers and gold seekers find their meat excellent eating, and the long haired pelt serviceable covering. These animals in appearance seem to belong as much to the sheep family as to the bovine.